Spring/Summer 2017 Sophia Webster exudes attitude, exploring a tropical colour palette against a backdrop of iconic 60s musical influences. Vibrant prints and delicate embellishments navigate us through the wonderful world of the ‘Dolly Birds Of Paradise‘. fashionable Dolly Birds of the 1960s. Each look is accessorised with a matching bag- crystal embellished rose gold box clutches and beaded speech bubble bags with phrases inspired by the memorable vocals of 60s female girl bands. reminiscent of the captivating charm and glamour of the Motown girl groups of the 1960s. 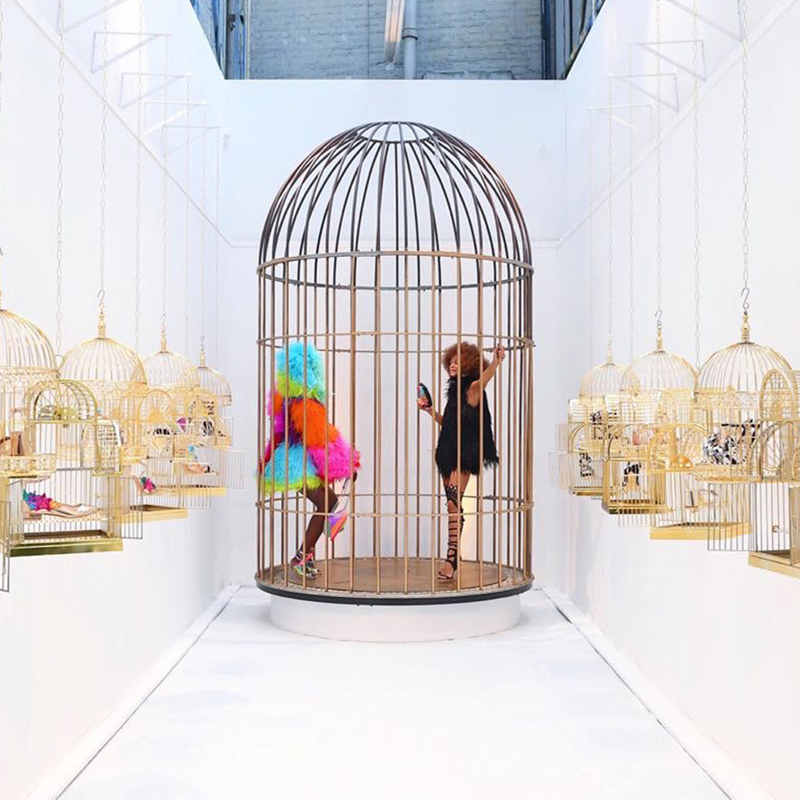 Room Two uses the paint-splattered space to display botanically influenced designs and suspended multi-colour birdcages, inspired by Alfred Hitchcock’s pet shop in ‘The Birds’. Birds of Paradise of both species are recurring motifs. The ‘Dolly Birds Of Paradise’ swing in caged chairs, perched under a birds’ nest arch and showcase their accessories amongst tropical flora and foliage, beneath a conservatory style roof. This collection celebrates my love of music, in particular the original Dreamgirls: Diana Ross and The Supremes, The Shirelles and Martha Reeves and The Vandellas – all musical icons of the 60’s. My inspiration was ‘Dreamgirls’ meets Hitchcock’s ‘The Birds’s set within a tropical paradise. This concept enabled me to experiment with the distinctive and feminine shapes of the 60s in bright, vivid colours and an array of different textures.